An informative and historical overview of Grundy County, Missouri including three separate books on one CD which include 10 historical maps (1851, 1862, 1876, 1899, 1902, 1904, 1911, 1913, 1920's, 1929, and 1939) showing the locations of 19 settlements; plus the full 1881 Birdsall & Dean History of Grundy County, Missouri book including 424 family biographies plus the 1925-1927 Grundy County Directory with thousands of names. An important resource for the study and research of Grundy County, Missouri history (including Civil War history) and genealogy. 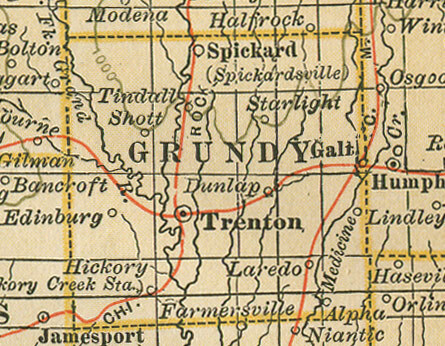 H. A map of 1913 Grundy County, Missouri showing the locations of the following: Alpha * Buttsville * Dunlap * Edinburg * Galt * Hannah * Hickory * Laredo * Lindley * Parkerton Station * Shott * Spickard * Starlight * Tindall * Trenton * Wyandotte * and the location of the townships. This map also shows the locations of numerous schools, churches, cemeteries, streams, and early roadways. I. A map from the 1920's which includes details of where various tourist sites and service stations were located. This detailed (616 pages in all) 1881 history has an incredible amount of historical and genealogical information about Grundy County, Missouri from its earliest settlement up to 1881. This is an exact photo replica of all the pages pertaining to Grundy County, Missouri including all of the historical and biographical information. Included are a total of 424 different Grundy County, Missouri family biographies. This 334 page Directory of Grundy County includes thousands of names with their street address and occupation. Also included are street directories and numerous business display ads. An important guide to locating thousands of persons in Grundy County during the 1920's. The cost for this CD containing all three sections described above is only $9.95 plus shipping, or only $5.95 as a digital download. A large amount of history and genealogy information for very little cost! A truly fascinating view of Grundy County, Missouri from its first settlement up to 1881. Since we offer many different county history and genealogy CDs, please be sure to specify that you wish to order the Grundy County, Missouri History, Genealogy and Maps CD. If ordering more than one CD, the shipping cost is $1.95 for the first CD plus only 25 cents shipping for each additional CD purchased.